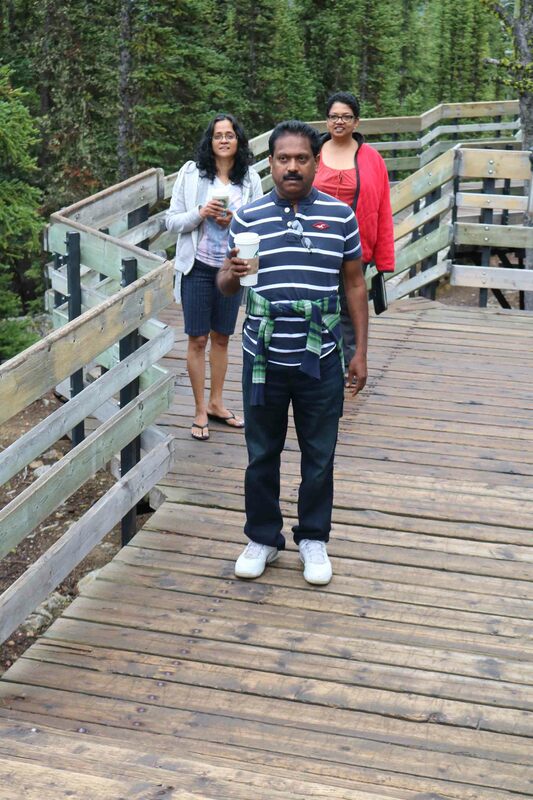 After visiting the Columbia Icefields, we travelled to the town of Banff and stayed there overnight. The town of Banff was intended to be a tourist destination from its very inception. 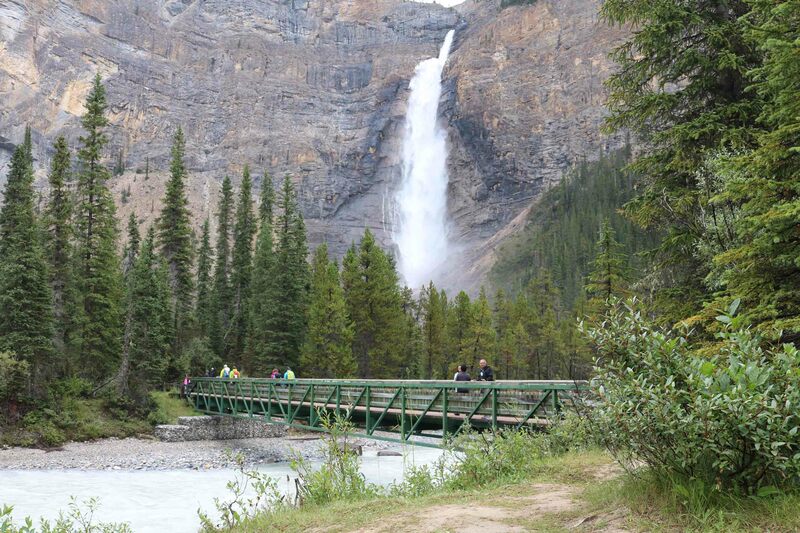 The town is situated in a valley in the Banff National Park, enclosed by the beautiful and rugged Rocky mountains. The city streets are lively with tourists and is lined with top class restaurants, bars and shops. 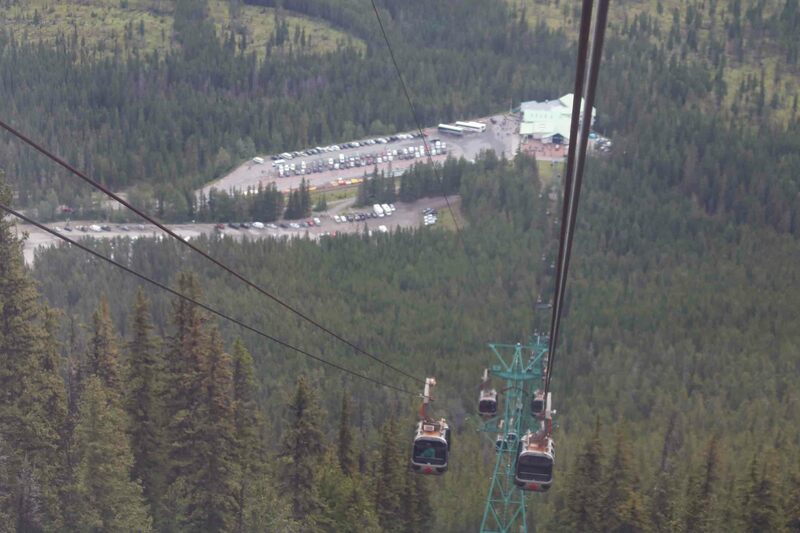 The town boasts of the Banff Sightseeing Gondola, located just five minutes from the Town of Banff, on the shoulder of Sulphur Mountain. 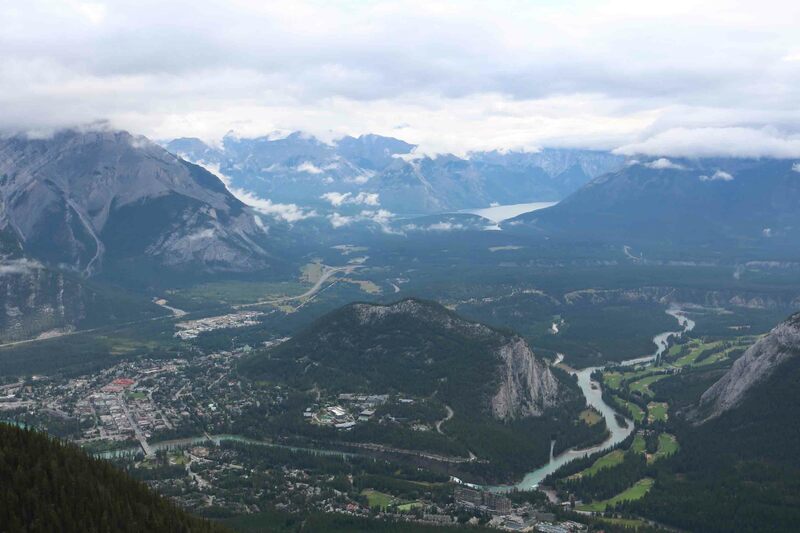 The gondola ride offers a marvellous view of the town of Banff as well as the mountains around. On the morning of August 08, 2016, we boarded a four-seater, glass enclosed gondola at the base. 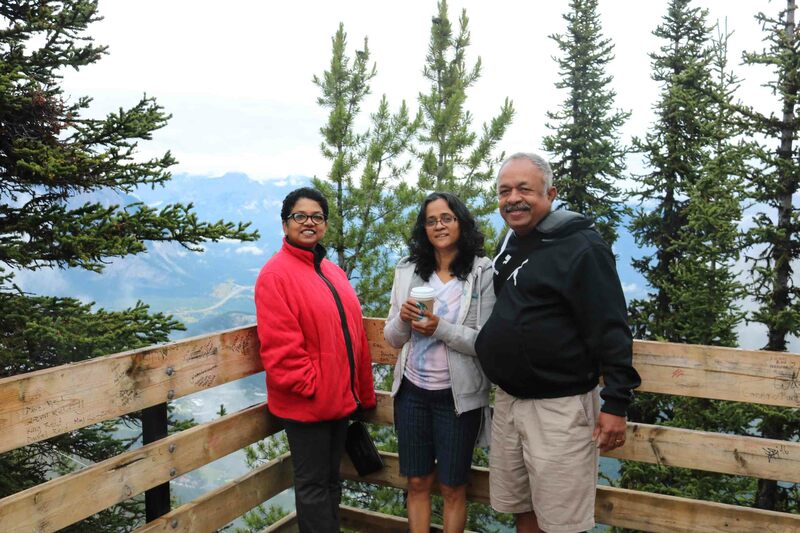 The glass bottom of the gondola provided us with a 360 degree panoramic view of six scenic mountain ranges around Banff. Below us, as we were moving up was the walking trail leading to the summit and there were many hikers enjoying the same view. 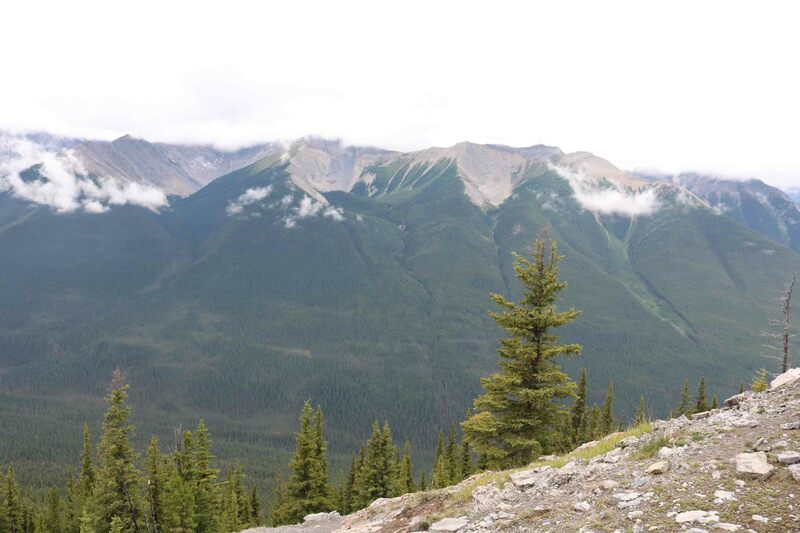 After about 10 minutes in the gondola, we reached Sulphur Mountain at an elevation of about 7,500 ft. It felt like being on top of the world as we stood on the spacious main level observation deck. We got on to the Skywalk, a kilometer long walkway, created out of cedar wood platforms and steps, leading up to the Sanson’s Peak Meteorological Station. As we ascended to the top, it offered us with some incredible views into the valley. There were information boards placed at all the viewing decks explaining what we were seeing in front. The Sundance Ranges was the most prominent of the mountains around the Sulphur Mountain, standing up majestically tall. Sundance is a sacred ceremony for the Aboriginal people who lived and travelled through these mountains for many centuries. The ranges got its name from the many Sundance sites at the base of these mountains. On top of the summit was the Sanson’s Peak Meteorological Station. In the early 1900’s, Norman Sanson climbed a trail up the mountain every week. For nearly 30 years he recorded the weather data at the historic stone building that is still standing. From the summit we had a mesmerising view of the Moraine Lake, cupped high among the lofty mountains and the Bow River which originates from this lake, flowing through the Banff town. 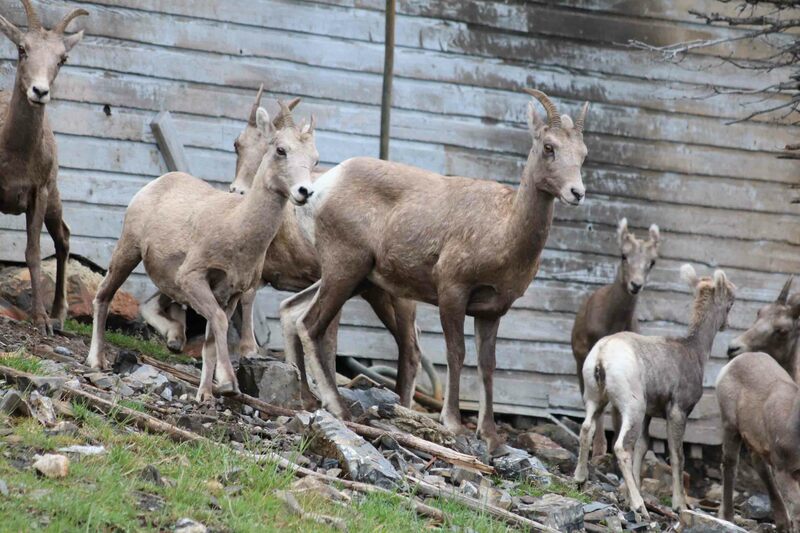 On our walk back, we were greeted by a flock of Big Horn Mountain Sheep. They were grazing on the lichens that had grown on the piers of the wooden walkway. There were many squirrels or marmots running all over the walkway as we descended. 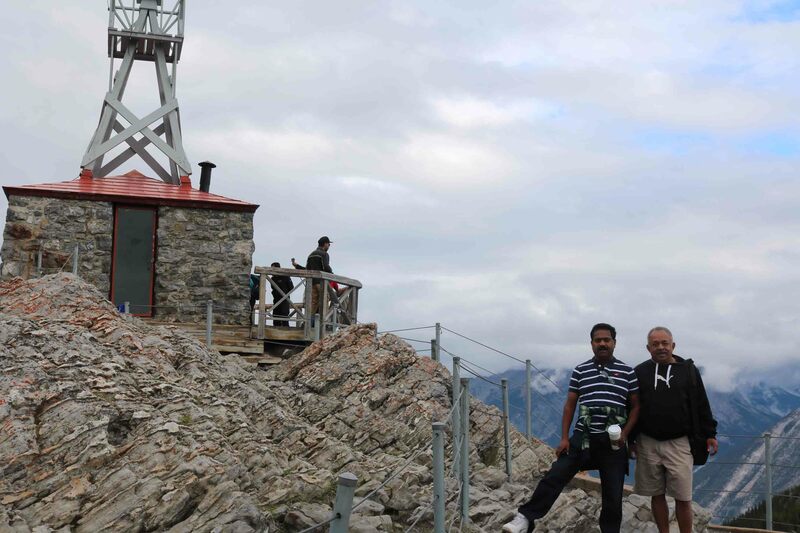 After enjoying the scenic beauty the Sulphur Mountain offered, we returned to the base on the gondola for our onward journey to the Takakkaw Falls, the second highest falls in Canada. Takakkaw Falls, fed by the Daly Glacier, is a waterfall located in Yoho National Park, near Field, British Columbia. Its highest point is 302 m from its base, but the water’s true ‘free-fall’ is only 260 m. It is a major tourist attraction in the summer as the melting glacier keeps the volume of the falls up during the warm summer months. In the fall, the water flow slows down and the raging falls narrows down to a ribbon of ice awaiting summer to set it free. As we drove off the highway through many hairpin bends to the falls, we were greeted by the tremendous thunder of Takakkaw Falls. The Yoho Valley access road to the falls is closed during winter due to high-frequency of avalanches. The road is only open from June through October for the summer season. We left our car in the parking lot and made our way through a forest track, walking for about 10 minutes, we reached the base of the falls. As we got closer to the falls, we were blasted by the deafening sound of the water pounding against the rocks. The walk was enjoyable as it offered a clear view of the falls throughout and the light spray from the falls really refreshing. As we inched closer to the falls, we were drenched from head to toe. 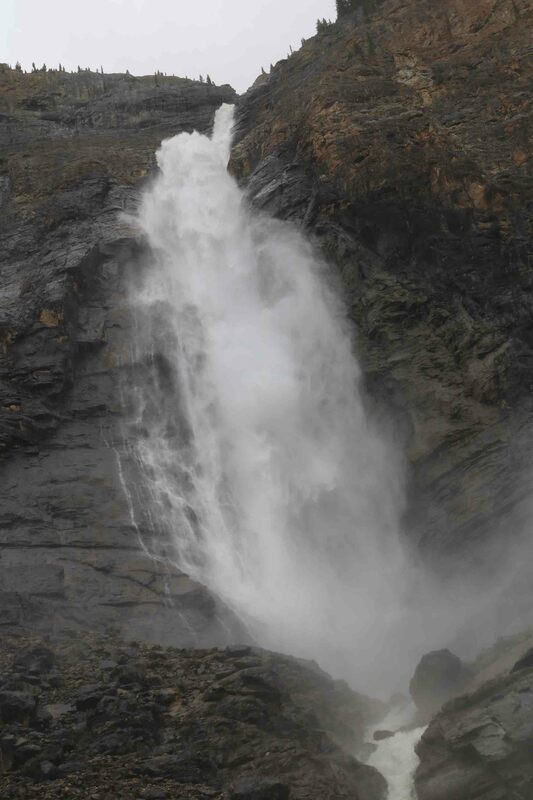 The falls appeared to be in slow motion as the wind in the area literally carried the water away from the rocky face. The falls being high, a large amount of water never reaches the base as it is carried away into a mist that creates many interesting shapes and swirls. From the breathtaking falls, on our drive to Whistler, we entered the Lil’wat Territory. Lil’wat is an aboriginal group of people and also one of the largest Indian reserves by population in Canada. Líl̓wat artifacts dating back to 3,500 BC have been found in this area. Lil’wat’s connection with the land has been both economic and spiritual, with a harmonious relationship with nature — a value that remains strong today. They harvest wild fruits, hunt deer and fish. They have passed on their traditional arts, ceremonies and beliefs over the generation and teach their children St̓át̓imc language even today. 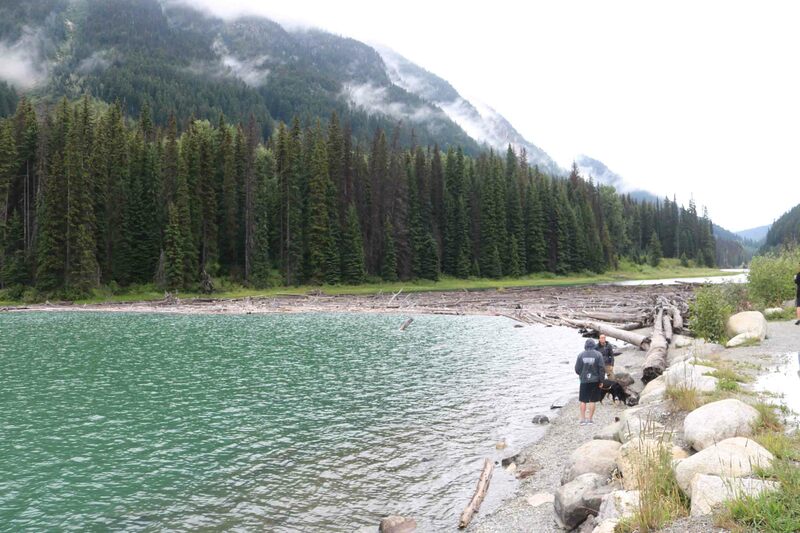 We halted at Duffey Lake. The lake is called by the Lil’wat as ‘Teq’, meaning ‘blocked’ or ‘stuck to be in the way’. This name comes from the log jam at the Eastern end of the lake. 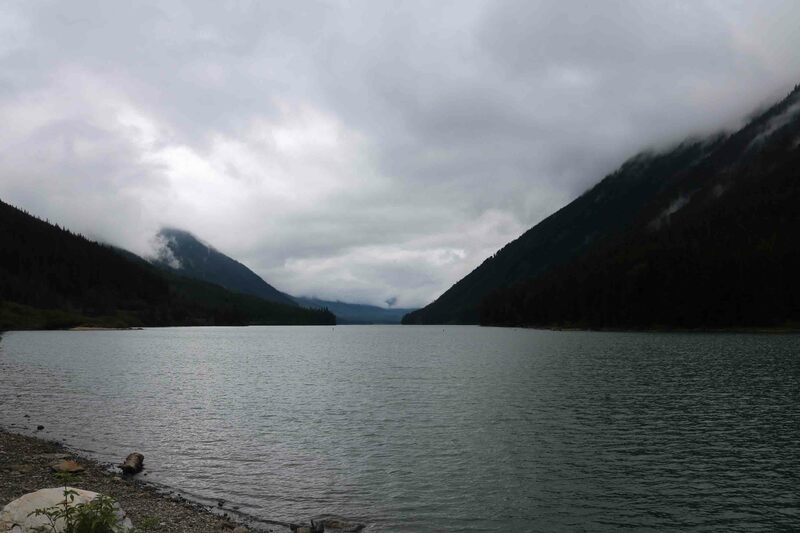 The Western end of the lake is called Sd’akw and beyond that is the Cayoosh Mountain. We Canadians are blessed with an abundance of natural wonders with enough lakes, mountains, waterfalls and rivers to keep us exploring for our lifetime. Brings back vivid memories of our visit there. Well described again, Reji. 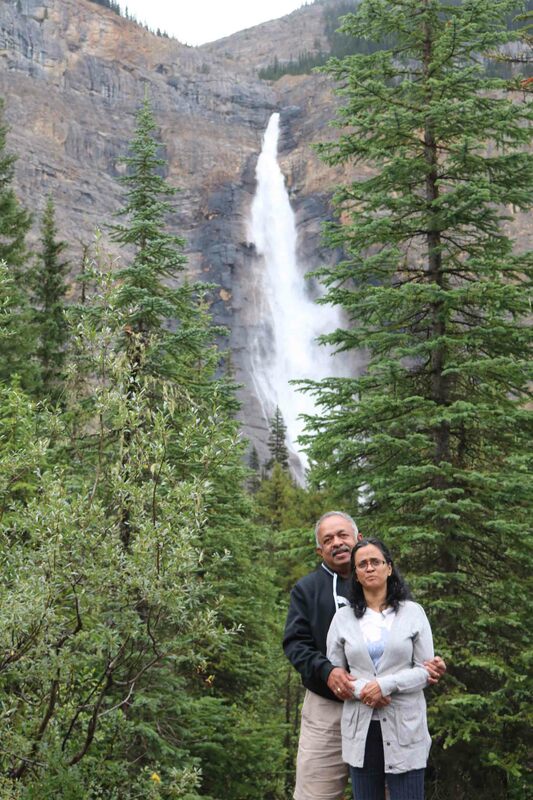 The pics are fantastic, esp the one where the two of you are standing at the bottom of the waterfall.